Many times at the beginning of a review I'll write about the artist name or cassette title, but this time it just makes so much sense to me that I don't even need to spend the time writing about it. I get it. It makes sense to me. 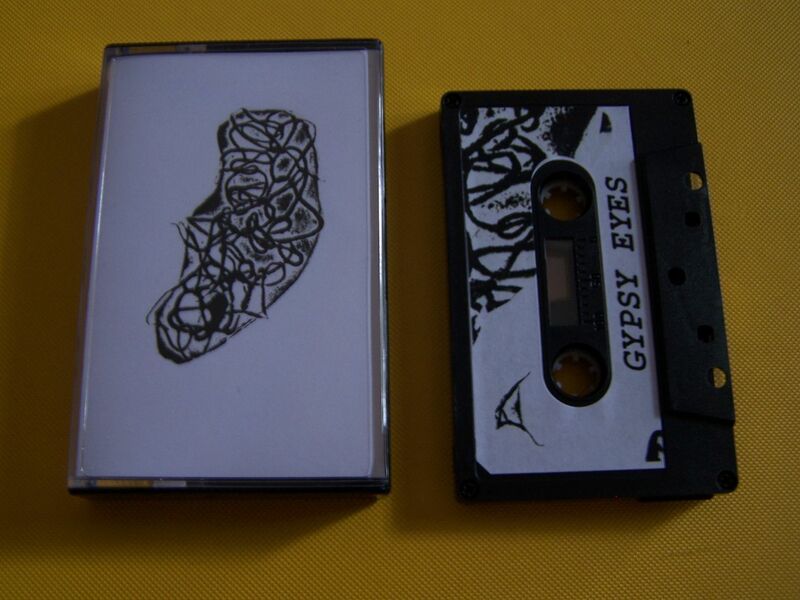 I just can't help but wonder if anyone ever told Gypsy Eyes they wouldn't play a show together or whatever the reverse of what I do is because of their name. 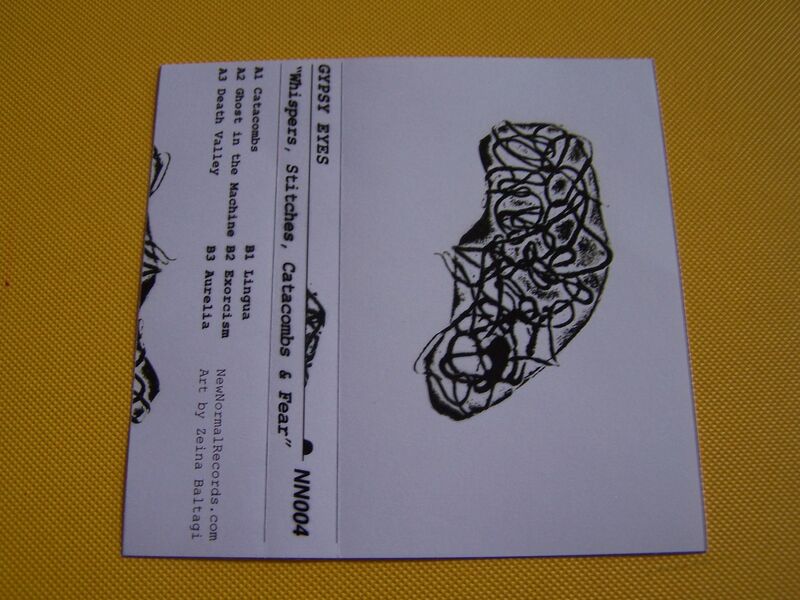 It's actually funny because someone once told me they'd only send me a cassette to review if I changed my name. I replied and said "Of course! What should I change it to?" and never heard back from them again. But it seems like people have cooled down with the name for me so I hope that Gypsy Eyes doesn't feel the same sort of prejudice from ignorant fools as I have. 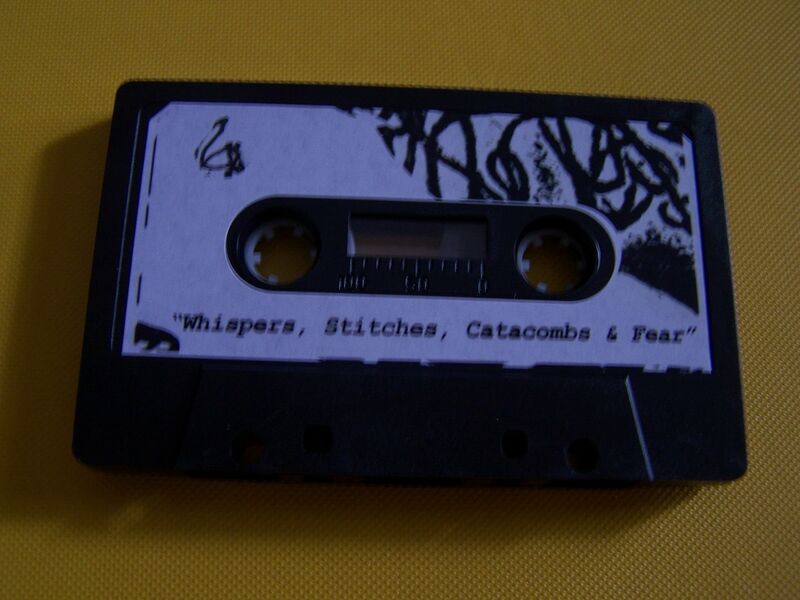 "Whispers, Stitches, Catacombs & Fear" begins with a hollow sort of whirr sound with various electronics mixed in with it. On one hand it can sound as if someone is changing radio stations on one of the old fashioned radios- with the knob you turn- and at the same time I feel like it also might be someone simply trying to find a certain frequency and so they are set at that number but are moving around and adjusting the antenna in hopes of getting a clearer signal. Bits of R2D2 can be heard as well as spoken words, static and the searching sound of the metal detector. There is also this atmospheric feeling which would suggest this was taking place in space, which is an ideal scenario for someone looking for a transmission in hopes of returning to Earth. Lasers begin to bleed through and create a fax modem sound. As it becomes heavier on the electronics the sounds of laser shots being fired can be heard. Muffled speaking of sorts bring out sounds of static but not in the typical distorted sense but more of that old radio sound. Everything goes quiet and the piece seems as if it could be nearing its end before the transmission slowly builds itself back up again. Hollow static reigns through now in a specific rhythm. This builds up and becomes a steady sound now which can only remind me of being inside a subway tunnel somewhere as it has that feel of a train passing by at a very high speed mixed with the slight echo that the tunnel itself would generate. How this fits in with what was heard before it is up to you- the listener- to decide. 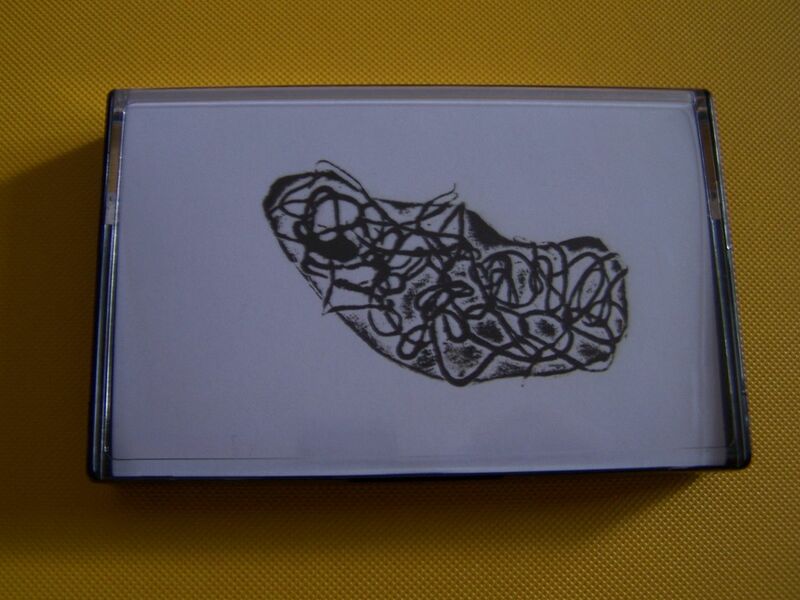 Side B opens with the sounds of the magic crystals and then it goes into some sliding type of sand sound, as if some contents are shifting within some kind of shaker. The sound is distinguished within ominous bells and crashing waves as it feels like something magical. There is a rubbing of a balloon, a stretching of it also, type of sound now that has created something different than the previous shaker feel but those crystal type tones can still be heard in the background of it all. This can come out as a bit of electronics which does remind me of how this whole thing started, even though it seems to now also have the sound of the ever-expanding universe trapped within it as well. 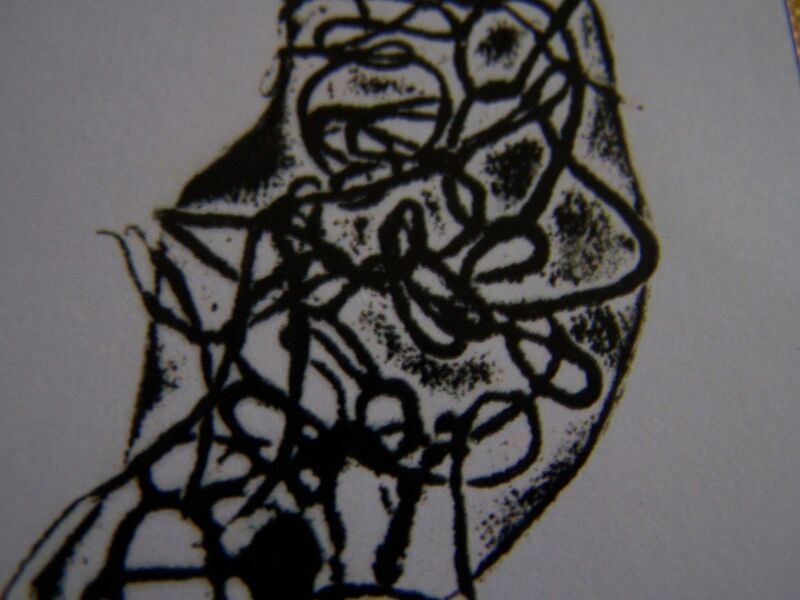 Sounds similar to bells and the twang of acoustic strings come out in a loop next. The magic of the crystal tones begins to build up behind it and I'm thinking we have found The Key that He-Man was searching for in the "Masters of the Universe" movie. The loops have become almost unrecognizable now as they are buried beneath the blissed out synth. The synth sounds- which somewhat have that crystal feel to them still- begin to not only take over this once guitar type loop so that it drowns out the sound but now it also has mimmicked the pattern of it. If you at all feel like Side A had been set in space with perhaps the radio frequencies being used to find a way home then I can only imagine this as being a means of alien life taking over humans, adapting and thus living among us unknown. A lot of times when I listen to this instrumental music which generates movies within my mind I think of it not so much as the fact that you also must see what I see but just that I will see something and then that is all that I can see. 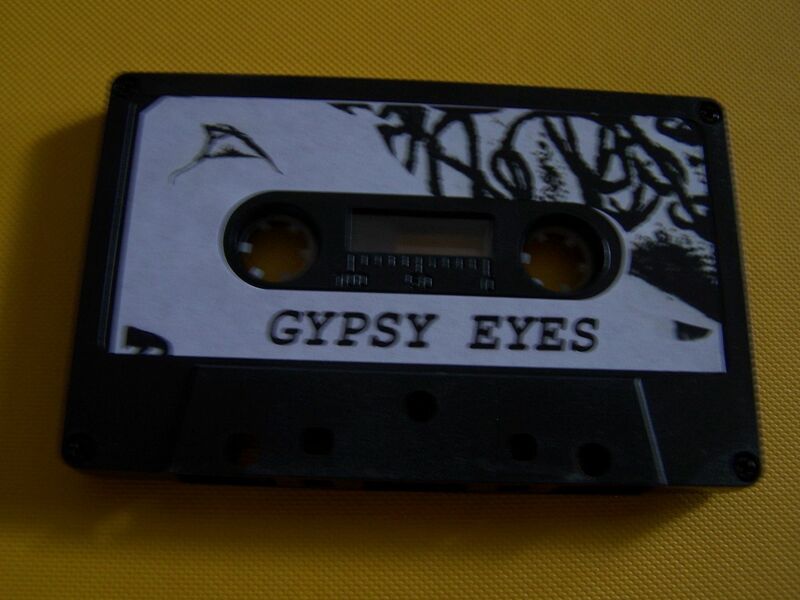 For this cassette with Gypsy Eyes though it's actually quite wonderful that I don't always see the same thing every time I listen to it and in that way I feel also that you might see something else than what I do. It's open to that level of interpretation and I do believe that no matter what images fill your mind you will still be just as delighted as I am listening to this because I've had this space adventure several times now but also some others when listening as well.